Thane, April 7 (IANS) The four-year-old miracle survivor of Thursday's Daighar building crash in Thane finally opened her eyes to harsh reality Sunday, and cried, much to the relief of surviving relatives and siblings, doctors said. The victim, Sandhya Thakur, had been unable to open her eyes, swollen with dust, watering (in the eyes) and psychological trauma, after the seven-storey building collapsed Thursday. She had spent several hours under the debris before rescuers dug her out. A total of 74 persons were killed in the crash, making it the worst-ever building collapse tragedy in the state in the past decade. Sandhya told rescuers, in broken sentences, her parents' names. She also mentioned her six siblings, an aunt and a grandfather, who lived with her in her native village. 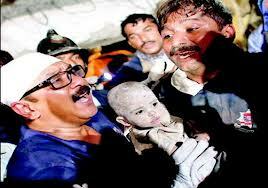 With great difficulty, the rescuers managed to find that Kiran, Sandhya's mother, had died in the building crash. The child's father and some of her siblings are still missing. Rescue operations were called off Saturday. Unable to open her eyes, Sandhya cried and asked for her parents, giving rescuers a harrowing time. A woman in the neighbourhood, identified as Joselyn, took Sandhya under her care, consoling and feeding her as efforts continued to trace her relatives. Sunday morning, Sandhya woke and opened her eyes. Doctors attending to her said her vision was unharmed. Earlier, doctors had carried out x-ray tests and confirmed that she had not suffered any other internal injuries or fractures. This morning, the Kalyan Police took Sandhya under its charge, relieving Joselyn of the responsibility, but the little girl wailed to go back. Medicos and police are hopeful she will calm down soon, as efforts continue to trace her kin. Meanwhile, as Sandhya's story was flashed on television, authorities were flooded with offers of monetary help. There were people also asking if she might be adopted.